Tawantan features three stunning bedrooms, with one king, one queen and one twin bedroom. All bedrooms have ensuite bathrooms. The home also has indoor and outdoor dining areas, an office, a library, a fully equipped gourmet kitchen and boosts 13,500 square feet of luxurious space. The home accommodates up to six guests. 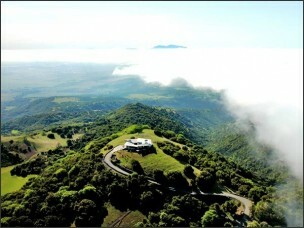 Tawantan is sits 2000 feet above the Napa Valley approximately half way between Sacramento and San Francisco. It is conveniently located just 20 minutes from a nearby town and 60 minutes from the beach. There are shuttle services from Oakland International Airports and San Francisco and transfers can be arranged by your ResortWorld consultant. Tawantan, “The House above the Morning Clouds” is an exclusive retreat located half way between Sacramento and San Francisco in the Napa Valley region of North America. This stunning luxury home was designed in by Helena Arahuete in the spirit of John Lautner’s Real Architecture. It is a one of a kind, timeless, flowing space inspired by its spectacular location, panoramic views and the owners brief for a home that felt like it was at the top of the world. This luxury retreat is partially recessed into one of the Twin Sisters Peaks and sits at the top of a 1700 acre private property making it the highest luxury home in the Napa Valley region. Tawantan, was designed to be almost invisible from the distance but open to the spectacular views in all directions. The homes design is truly unique and the owners have spared no expense when decorating both the interiors and exteriors of this stunning property. Custom made furniture and fittings, a fantastic collection of modern art and the careful thought that has been put into all aspects of this homes design will make a stay here an unforgettable experience. With four fire places and a stunning infinity pool, which can be accessed both inside and outside the house, it is the perfect place to relax, unwind and take in the awesome 360 degree view of the Napa Valley in every season. Watch as the landscape from the Golden Gate Bridge, the Sierras and everything in between change as the sun rises and sets. At times the home is fully enveloped in clouds, at others the home is above the clouds. The constantly changing view is fascinating and will leave guests with the feeling that they are indeed on top of the world. Tawantan offers three bedrooms, four and a half bathrooms and can accommodate up to 6 guests overnight. 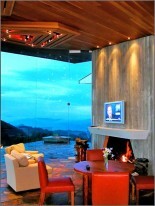 Its magnificent location at the top of the mountain ensures its visitors complete privacy during their stay. Guests can spend the day hiking, enjoying the views, swimming in the pool and relaxing in the hot tub. Visits to local Napa wineries are also easily arranged. Tawantan has 5 TVs, 4 DVD Players, Computer, Fireplaces, Alfresco Dining, 4 VCRs, Washer, Satellite TV, Wireless Internet Access, Air-Conditioned Bedrooms, Central Air-Conditioning Other activities that can be arranged on request include: Airport pickup, Driver, Winery tours, Catering, Restaurant reservations, Balloon rides, Picnics & Barbeques, Trail rides, Bed changes, Pool at 82 degrees, Florist, Massage, Heated Pool & Spa, Photographer, House stocked to your specifications, Fine restaurants – SF & Napa Zagat. There are also Golf courses nearby.